What a week of news! We have seen a lot of cool stuff this week, so time to end on a high note by taking a look at one of our Abyssinian commanders, Prince Unathi. Prince Unathi Zerezghi is the next in line for the Abyssinian dynasty. Like all Abyssinian rulers, he sees leadership as a privilege that must be earned. The undercurrent of growing conflict in the world led him to join the Abyssinian armed services, and, given the outbreak of global war, it seems he made a wise choice. Prince Unathi is a calculating commander, and he believes strongly in the ability of Abyssinian technology to overcome any obstacle. He puts this to test on the battlefield by asking those under his command to run field tests on various pieces of experimental equipment that might better help the Abyssinian forces as a whole. Unathi has a deep love for the people of Abyssinia, and he is willing to make nearly any sacrifice for their betterment. Nowhere is this more obvious than the use of his powerful rocket launcher, which has been outfitted with poison canisters. The Prince's concern for his enemies is almost nonexistent, and he is acutely aware of how many Abyssinian lives his poison gas has saved. On the tabletop, Prince Unathi is a generalist. He has a potent Missile attack and two strong Morale support actions that ensure he can apply force where needed. Unlike the Lord of Steel, Prince Unathi can begin to lose effectiveness as your forces are depleted. His Call for Reinforcement Action helps to offset this by allowing easy replenishment of any lost Fireteams. Effectively taking advantage of the Field Test Action can set up a lot of beneficial situations for Unathi. Prototype Actions are often quite potent, but they require you to discard a card. By using Unathi's Field Test to take those Actions, you can draw a card afterward. This allows for efficient card cycling, as low cards can be discarded in the hopes of drawing better cards. 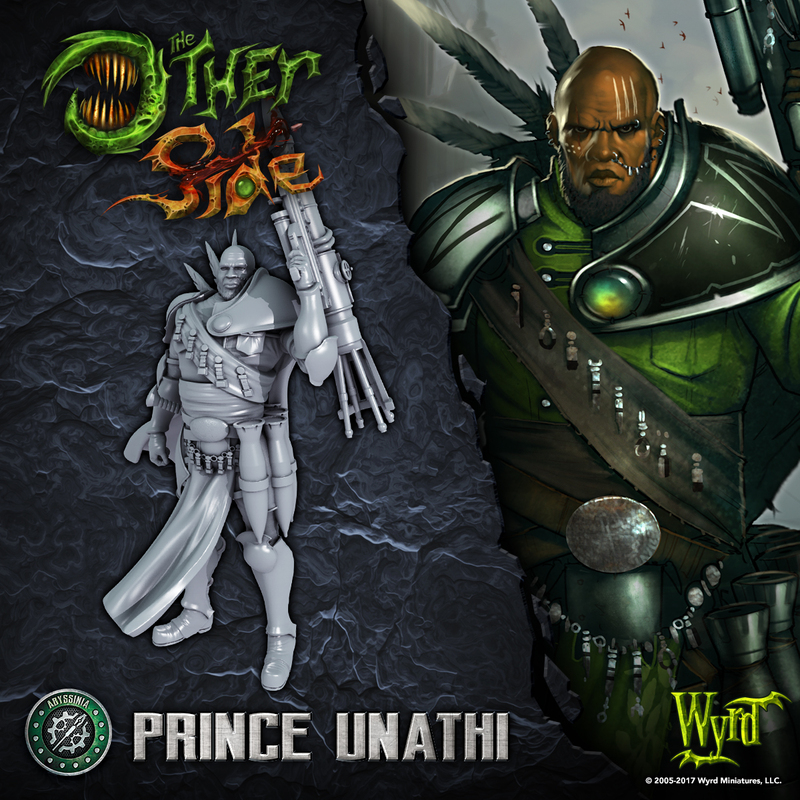 Prince Unathi is an all-around solid soldier, only lacking in Melee options. Getting the most out of him boils down to a player's ability to read the battlefield and apply his Actions to the right location. Love the fusion of anesthetics here! Unathi has been my favorite so far just going from the card images so it's great to see some fluff on him. Can't wait to get this guy on my painting table! Me either, but it was there earlier. @Paddywhack Fixed it for you! I guess you didn't fix it for me, though. Cool, no big deal. Ah, I can see the bottom picture, but the top still has a dead jpg link. Interesting that his style sounds like it will complement the Lord of Steel--makes those two commander games have an interesting dynamic. @spooky_squirrel the tech gremlins have been messing with me today. It seems to have been actually fixed now. Yep, just the one image!